It’s no secret that data breaches are on the rise. In fact, there have been more data breaches than ever before. Medical data breaches are proven to cost more than any other type of breach, costing about 400 dollars per record. Data breaches are rising dramatically putting them on the agenda for most C-suite and corporate boards. Customer information is being lost, trade secrets are being sold and confidential assets being breached can significantly lower customer loyalty and trust as well as definitely lower the reputation of those companies which were breached. They can also give the competition a significant advantage. These aren’t the only things that companies have at stake. The many different types of cyber-security risks make cyber-security a vastly complicated problem. In fact attempting to protect the many different frameworks and CMS and private networks is fraught with other complications to layer on top of the complexities. Today, governments are seeking ways to stem the tide of breaches and break-ins by creating new legislation that provides for specific levels of security and best practices for companies. This tidal wave of governments and new cybersecurity regs and recommendations make additional problems in and of themselves. The United States government alone has proposed more than 200 bills (actually 240 at last count.) This includes legislative proposals for ways to deal with cyber-security. This number of mandates and proposals have taken place in just the past three years alone and the number continues to rise. The proposals fall into a wide range of categories. In some cases the proposals are that companies implement direct requirements for protection. One example of this is that companies in the critical infrastructure arena are going to be facing requirements for security in the US and in the UK and EU as well. They will have specific requirements for risk assessment, control and for personnel training. The question is how can a country legislate a level of security when that level cannot be guaranteed by any company. There are even “trade secret” protection laws in the works that require companies to take “reasonable steps” in order to keep information about the programs and devices safe from cyber threats—though what those steps are is another unknown. In addition to legislating the devices and services that are being legislated, share holders are becoming more demanding that companies safeguard medical and technical information. That means that securities laws as they relate to new IoT devices and services are also being legislated. In the United States, some measure of shareholder litigation as well as SEC proposals and enforcement are already launched and seeing some effect. With all of the changes and the advances in technology, it’s no surprise that legislation will follow. Is your company ready for the changes that are being made in IoT and internet services? The National Institute of Standards or NIST, offers one of the most comprehensive tools for managing the risks involved in information security. Even the federal government agencies of the US are embracing it wholeheartedly. In a survey undertaken by Dell, more than 80 percent of professionals in the security arena are using the NIST framework for improving their own security, which makes it a great place to start for companies which are trying to come into line and ensure their compliance to the expected new regulations. According to the experts, the NIST method and framework may well be the guideline that the courts and legislators will use to determine whether companies in the IoT and IT business are doing their best to secure devices and provide for data security. There are other standards that are entering into play such as the ISO 27001 which is being used by many companies. The standard is different structurally than the NIST Framework though NIST makes reference to the ISO requirements in their own framework. What is your company doing to secure their data and IoT devices? How are you set up to come into line with the regulations and legislation that is sure to be just around the corner? Every company should be taking steps now to implement some type of protection to meet the ever changing threats as well as the ever changing cyber-security regulations. A new strain of the famous Mirai IoT malware surfaced recently, with the discovery by Chinese researchers of exploit code targeting networking equipment. Previously, Mirai was known for having infected thousands of webcams, security cameras, and DVRs, and then using those devices to launch DDoS attacks. The exact aims of the new variant are still unknown, but it’s another reminder of the very serious security issues presented by the IoT. Last month, a Gemalto survey took a closer look at those issues and people’s perceptions of them. An overwhelming 90 percent of consumers reported that they lack confidence in the security of IoT devices. Their most common fear (65 percent of respondents) is that a hacker could gain control of their devices, while 60 percent worry about their data being stolen via connected devices. In spite of such concerns, over 50 percent of consumers now own an IoT device (on average two) but only 14 percent believe that they are extremely knowledgeable when it comes to the security of these devices. The survey also set out to discover how IoT companies addressing these concerns. The survey found that IoT device manufacturers and service providers spend just 11 percent of their total IoT budget on securing their IoT devices. These companies do, however, appear to recognize the importance of protecting devices and the data they generate or transfer, with 50 percent of companies reportedly having adopted a “security-by-design” approach. Two-thirds of organizations reported that encryption is their primary method of securing IoT assets, with 62 percent encrypting the data as soon as it reaches their IoT device, and 59 percent encrypting as it leaves the device. Encouragingly, 92 percent of companies said they see an increase in sales or product usage after IoT security measures have been implemented. Also encouraging; businesses are realizing that they need support in understanding IoT technology and are turning to partners to help, with cloud service providers (52 percent) and IoT service providers (50 percent) reported as the favored options. While these partnerships may encourage adoption, most organizations (67 percent) admitted they don't have complete control over the data that IoT products or services collect as it moves from partner to partner, potentially leaving it unprotected. Stakeholders on all sides are looking to the government for guidance. The survey found that almost every business organization (96 percent) and consumer (90 percent) is looking for government-enforced IoT security regulation. As new malware continues to exploit gaps in the IoT ecosystem, both consumers and businesses are justified in their lack of confidence in service providers and device manufacturers. The EU is demonstrating with its GDPR law that it recognizes the importance of this issue and that effective legislation is possible. Here in the U.S., each of the groups involved in the IoT ecosystem – manufacturers and cloud service providers, not to mention the government – should adopt a 'security-by-design' philosophy. The security for Internet of Things has to be tightened and a safe environment must be created which remains free from hacking and unethical activities. In IoT ecosystem, gateway security is of prime importance since it is the key piece of data collection in the connected system. But how to ensure security of IoT gateways? Read this blog to find different ways to secure IoT gateways. Along with many technological, environmental, and economic benefits, the rapidly moving connected world also represents an array of growing attacks like side-channel attacks, fault attacks, physical tampering, etc. Considering these risks, ensuring security and robustness of IoT becomes inevitable, in which IoT gateways play an important role. IoT Gateways are undoubtedly the heroes of whole IoT paradigm, as they are the key piece of data collection in the connected system. 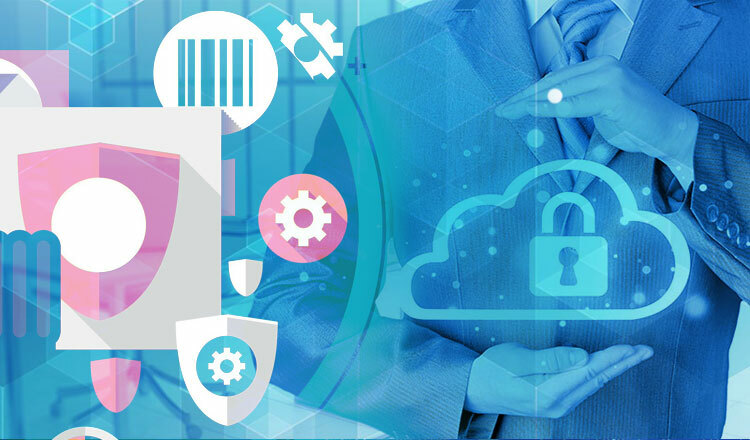 In IoT ecosystem, security is the key aspect, in which, IoT gateway security is of prime importance since a secured gateway enables robustness of the entire IoT environment. If there are no sufficient security measures, there are chances of potential risks like malicious threats, spoofing, man-in-the-middle (MITM) attacks, data snooping, etc. If you lose a gateway in the middle of the communication chain, it will jeopardize the entire IoT ecosystem as gateway act as a gate or bridge between the edge devices and cloud. So how do you know whether your IoT gateway is secure or not? How can edge device sense and prohibit unsecured gateways, or vice versa? How can peripherals ensure their data are successfully relayed in the face of gateways? What happens if someone snoops the data from the gateway? What if the gateway is located in a remote location and is sending incorrect information to the cloud? In this case, how can gateways help in reverting information? Is it possible for gateways to build and demonstrate reputation-based trust? Trustworthiness of gateway is the key aspect in the IoT ecosystem. To overcome the security concern, let’s explore some of the key hardware security aspects that can be implemented to secure IoT gateways. It is a microprocessor that integrates with system hardware on a gateway to perform crypto operations, such as key generation, key storage and protects small amounts of sensitive information, such as passwords, measurement data for boot software and cryptographic keys to provide hardware-based security. 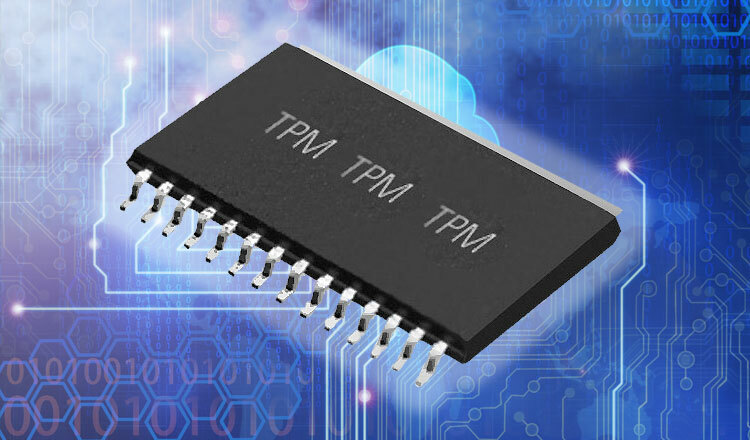 TPM is often built into a system to provide hardware-based security. It is a combination of hardware and software to protect credentials when they are in unencrypted form. TPM is based on a trusted execution environment (hardware root of trust) that provides secure storage of credentials and protected execution of cryptographic operations. It is isolated from the main CPU and implemented either as a discrete chip, a security coprocessor or in firmware. Microprocessor scans the firmware and validates the key. If the key is valid, then the processor begins executing the firmware, but if not then, processor halts. The TPM is used to store platform measurements that help ensure that the platform remains trustworthy. It contains a set of registers that comprise of RTM measurements for launch modules of the boot software. The computing platform must have a root of trust for measurement (RTM) that is implicitly trusted to provide an accurate validation of the boot code modules. The TPM provides the root of trust for reporting and a root of trust storage for the RTMs. The TPM stores a set of “known good” measurements of boot components that are securely generated and stored. Hardware Root of Trust/Chain of Trust: It is the fundamental part of secured computing. 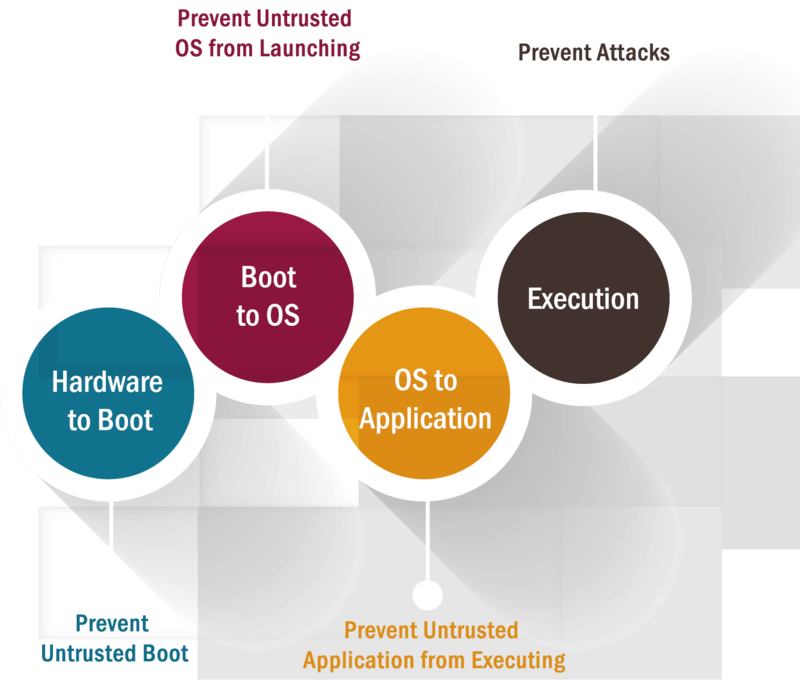 The secure boot process is utilized to implement a chain of trust. Bootstrapping is a secure system or device that involves a chain of steps, where each step relies on the accuracy and security of the previous one. At the end of the chain, you assume or verify the correctness of the last step – this step becomes the Root of Trust (RoT). The Root of Trust is provided by hardware services, including cryptographic support, secure key storage, secure signature storage, and secure access to trusted functions. This allows the creation of a trusted module forming the basis, or root, for validating other components within the system. The chain of trust begins with the bootloader. From this boot loader, the OS is validated, and from the OS, the applications are validated, creating a chain of trusted elements. The TEE is an insulated and secure area of the main processor providing security functionality for application integrity and confidentiality. The TEE differentiates between security functionality and operational functionality. It mainly consists of three parts: Trusted OS, internal micro-kernel, and APIs. Used for security check parallel to standard OS. Common security functions include isolated execution of security operations, the integrity of code loaded and data stored and confidentiality of data stored in the TEE. It protects data-at-rest and data-in-use within the TEE. It also provides higher performance and access to a large amount of memory. All the above security properties can be achieved using the measured boot, secured boot, and attestation. Secured Boot: It is a security standard verified by the trusted OEMs that ensures authenticity and integrity of a device’s boot. When the first boot happens, only the validated code from the device OEM is allowed to run to verify and validate the authenticity of software present in the gateway. This prevents attackers from replacing the firmware with versions created to perform malicious operations. It provides the APIs required for code signing, code validation, and secure firmware updates. Measured Boot: Measured boot is generally used for integrity protection. As anti-malware software has become better at detecting runtime malware, attackers are also becoming better at creating rootkits that can hide from detection. Detecting malware that starts early in the boot cycle is a challenge. At this time, measured boot measures each block, from firmware up through the boot start drivers, stores those measurements on the hardware, and then makes a log that can be tested remotely to verify the boot state of the client. Attestation: In cloud computing scenario, attestation is an essential and interesting parameter, often rooted in having trusted hardware component to build trusted system. It is basically used in the process of validating integrity in terms of software and information for securing embedded systems. Attestation uses cryptography identity techniques that confirm the identity and authentication credentials of remote devices, without revealing the devices and their own identities. IoT gateways are crucial to addressing the inherent complexity. By using the pre-ensured hardware building blocks like TEE and TPM, you can secure the whole communication chain from the connectivity of legacy devices, data storage on a gateway, secure data transmission as well as the fast deployment of data on the cloud to perform intelligent analytics. There should be some programmable architecture that ensures confidentiality and integrity against specific attacks. So, layered IoT gateway security is essential. This infographic takes a look at the number of devices, incidents and vulnerabilities in medical devices. In my recent interview with Sam Shawki, the founder and chief executive officer of MagicCube, I wrote about getting a new Ram Truck and noted that it was a beast not just in size and towing power, but a beast of electronics and connectivity. According to Intertrust Technologies, the percentage of new cars shipped with Internet connectivity will rise from 13% in 2015 to 75% in 2020, and that in 2020, connected cars will account for 22% of all vehicles on the road. That number is sure to grow. More stats in the infographic below. An accurate and well-structured security analysis is the key for a holistic security concept and therefore for a secure product. But planing and performing a security analysis can be a hard nut to crack. After collecting experience in more than 6 big IoT projects over the last 2 years I decided to share some key facts that can make your life easier if you have to go the same way. Not far from San Francisco International Airport, San Bruno is a quaint middle-class residential suburb, yet underground in San Bruno was a gas pipeline controlled by SCADA software that used the Internet as its communications backbone. On Sept. 9, 2010, a short circuit caused the operations room to read a valve as open when it had actually closed, spiking the readings coming from pipeline pressure sensors in different parts of the system. Unbeknownst to the families returning home from ballet and soccer practice, technicians were frantically trying to isolate and fix the problem. At 6:11 pm, a corroded segment of pipe ruptured in a gas-fueled fireball. The resulting explosion ripped apart the neighborhood. Eight people died. Seventeen homes burned down. The utility, PG&E, was hit with a $1.6 billion fine. Continue reading this article on Quartz. They’re using unsecured IoT devices and creating botnets to launch catastrophic distributed denial of service (DDoS) attacks. This has given rise to the DDoS of Things (DoT). Privacy and Wearables in the Workplace - Is There an Issue ? Wearable devices have become hugely popular in recent years, to the point where it’s no longer novel to see people wearing smartwatches and fitness trackers out in public, or even in the workplace. As much as these devices have allowed for new experiences and added convenience in business and professional settings, they also come with a certain level of risk. In business cases, a number of companies are now considering wearables as devices to use in their health and wellbeing strategies, or even for staff tracking and other operational functions. Is this a good thing for the employment relationship, and should employees have concerns regarding their privacy and the use of mandated wearable technology? In an age when the majority of electronic devices are becoming increasingly connected, it is reasonable that the average person should have some concerns regarding their privacy. In personal life, a user can take their own steps to protect their personal data; so what happens when it’s an employer that controls the collection, storage, and use of personal data? For any organization to be able to make use of wearables for any kind of employee tracking or data collection, it is important that full disclosure is made. Employees need to know what data will be collected, how they are expected to provide it (through wearables or other biometric devices), and how that data will be used. Employers have an obligation to provide all of this information upfront, and an element of transparency will help to facilitate the acceptance of any new workplace policies regarding mandatory wearable devices. Being transparent is the first step, but it’s not enough on its own. Employers need to have an appropriate security solution that will prevent data loss, unauthorized access, or even data theft by third parties. The intent to protect data should be outlined in contractual employment agreements, and should comply with any local or federal laws regarding information collection and storage. While organizations do have some rights to collect data with employee agreement, they should also be aware that employees have the right to decline participation in any new wearable device data initiatives, which could lead employment disputes and loss of valuable staff. With such a fine balance between making use of new technology and data, privacy, and the employment relationship, organizations will need to be careful when developing strategies regarding wearable devices. It needs to be clear how such devices and data collection will benefit an organization, and appropriate messaging should be in place to achieve employee buy-in for any new initiative. With the right approach, wearables could allow companies to better track staff attendance, manage workplace incidents, and even ensure the health and wellbeing of employees. However, without the right management, the push for wearables could easily damage the relationship between employees and employers, making strategic planning and communication an essential aspect of implementing any new technology in the workplace. By 2021, it is estimated that big data could reach $66.8 billion in net worth. But as the volumes of data that becomes accessible increases, so do concerns with privacy as the data out there might not be exactly what people want to have released. In fact, more customers have become vocal about their concerns with the data that is being collected by them. With potential security challenges and high profile breaches taking place all the time, people are demanding better protection. With data breaches giving sensitive personal information to thieves that results in millions of people becoming victims to cybercrimes, it’s getting tougher for people to trust the online businesses they are working with. Perhaps this is why more people are demanding more action being done. With the monetization of big data, there becomes valuable databases that are targeted for attack. Many of which use a single level of protection now to protect the data they contain. This is why automated data transfers with beefed up security might be a better result. This will require new data to be validated, to reduce the risk of anything that isn’t trustworthy or accurate creating problems. Since the data would be monitored and tracked on a regular basis, the likelihood of a breach decreases. After all, the more data contained in a single resource, the more that can be obtained by cyber criminals, and thus there becomes more mistrust with the public, as they see new concerns being brought out against them. Companies must now accept greater responsibility for the personal information they maintain. While risk can vary, companies must accept that their responsibility is there. If a breach does happen, the public is more likely to be unforgiving, especially if there isn’t transparency with what happened and how the company will ensure that this never happens again. This includes those who attempt to pass the blame by using third party providers to help them store their data in clouds and other areas. As the responsibility for the data isn’t moved when you move the information, despite some misconceptions out there. Customers are also increasing in curiosity with how their data is being used. When you monetize big data, you are also releasing information to companies that some may be concerned as private. Fortunately, the government is actively reviewing this information and ensuring that better privacy focused measures are taken, so that companies can still benefit from the monetization of big data, without there being as much risk to the individuals that they are collecting the data on. While unauthorized use and service failures can still occur with the big data, it does seem like more companies are committed to protecting the data that they are handling. This means that even when monetization expands, customers will be provided with their privacy rights through digital databases, while having new avenues of encrypted protection released so there is never any concern with their information getting in the wrong hands. Tripwire, Inc., a security company, recently announced the results of a study conducted in partnership with Dimensional Research. The study looked at the rise of Industrial Internet of Things (IIoT) deployment in organizations, and to what extent it is expected to cause security problems in 2017. The big not so surprise: 96 Percent of IT Security Professionals Expect an Increase in Cybersecurity Attacks on Industrial Internet of Things. Yes, you should expect to get hacked. The study was commissioned by Tripwire and carried out by Dimensional Research in January 2017. A total of 403 qualified participants completed the survey. All participants had responsibility for IT security as a significant part of their job and worked at companies with more than 1,000 employees. Survey respondents were based in the United States (278), the United Kingdom (44), Canada (28) and Europe (53). Read more about IoT and security on IoT Central. To receive these articles, sign up on IoT Central. Why is the IOT Catnip to Hackers? What is Going on with Residential IoT Cyber Security? Big Data, IOT and Security - OH MY! The IEC (International Electrotechnical Commission), an organization that prepares and publishes International Standards for all electric and electronic devices and systems, came out with a new white paper that provides an outlook on what the next big step in IoT could involve – the development of smart and secure IoT platforms. How data is collected and implemented will determine how transformational IoT can become. Security grows exponentially in importance as devices that were once isolated become interconnected and more and more information is collected. As with most disruptive technologies, solutions are developed by a wide range of providers promoting their proprietary approaches, which can also impact interconnectivity. Bringing the ambitious visions expressed by IoT to reality will require significant efforts in standardization. The white paper provides an overview of where IoT currently stands, with a particular focus on IoT system design as well as architecture patterns, the limitations and deficiencies of the current IoT framework, and its security, interoperability and scalability. Several use cases from the industry, public and customer domains are investigated. Funding was from SAP and Fraunhofer ASEC.